The world has gone digital. Everyday people come up with new career paths that are run solely through the internet, particularly social media. 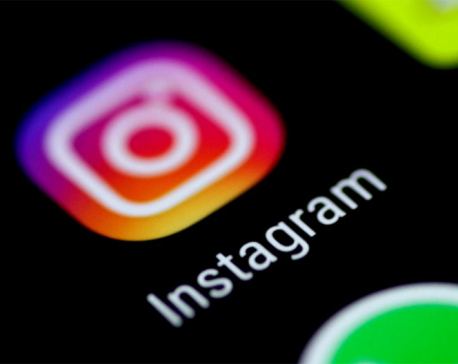 One of the new career paths that is slowly but steadily gaining traction as a legitimate profession is the Insta-artist, artists who earn money through their Instagram presence. We spoke to a few Nepali Insta-artists and got a sneak peek into their journey so far as well as their working styles. 24-year-old Alina Chhantel is a part time illustrator. She joined the Instagram artist crew about two years ago when she posted a drawing showing a girl wearing a pollution mask while walking out on the streets of Kathmandu. Since then she has posted about 173 more pictures and her sketches and paintings have progressively gotten better. What started out as copying the cartoon and anime characters she liked turned into a source of income for Chhantel. She currently works as an illustrator for Nera Publications. Chhantel mentions that she mostly gets inspiration for her artwork by watching animations and movies from the Japanese Studio Ghibli, looking through art by Nepali artist Ubahang Nembang and New York based artist Bikash Rai, who goes by @iejvxr on Instagram, and scrolling through her Pinterest feed. But she insists that she has moved past copying someone else’s artwork and whatever she does now is authentically her own, albeit she does incorporate a few things that have inspired her that day. She reveals that she is also into podcasts and especially loves listening to Art Side of Life to learn about new things related to art. “Uploading my artwork on Instagram has helped me in a lot of ways,” she says explaining that not only has she been able to keep a tab on her progress as an artist, she has also gotten a few collaboration offers from it. She claims that because she is involved professionally in this field right now, she makes it a point to sit down and draw, paint or sketch every single day. She says she spends hours practicing, drawing, redrawing, painting, and perfecting her artwork. She reveals that coloring is her favorite part of creating art as she finds it to be very relaxing and calming. Besides progressing as an artist, Chhantel is also a sociology student who is completing her final year of masters at Tribhuvan University. She reveals that although she isn’t sure whether or not she will take up art as her career choice, she definitely wants to incorporate it into her work somehow. Unlike most other artists who stick to one particular genre of art and spend years working exclusively on that Kajina Shrestha has been doing a little bit of everything. 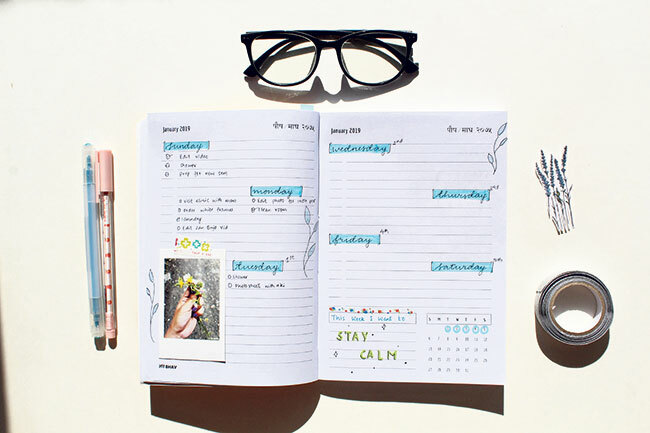 She creates DIYs, paints, sketches and keeps an art journal with meticulous spreads and interesting doodles. The 18-year-old mentions that varying between all of these different forms prevents her from losing interest in arts and expands her creativity to boot. Although she had always been interested in painting and sketching, it was only when she joined A Levels that she got to refine her art related skills. She says, “I took art as a subject I wanted to learn during A Levels and that was when I really got to understand it.” During this time, she also discovered art journaling and admits that currently that is her favorite way to delve into art because it incorporates everything from painting, sketching, and doodling to planning and writing. She lists @studywithinspo, @amandarachlee, and @soymilkstudie as her go-to Instagram accounts for daily art inspiration. Shrestha is also passionate about photography and frequently incorporates that into her journal. She says that she is constantly on the lookout for interesting things to capture in her camera and stores these pictures to upload later when the color scheme of the photo matches the theme she has going on in her Instagram feed. Shrestha has carefully and beautifully planned her Instagram feed and changes the theme color every few months. Until a few weeks ago, Shrestha uploaded pictures of her journal entries or paintings and sketches on her personal account. After getting a few requests for more frequent updates on her journal page spreads, she decided to open another Instagram account with the handle @kn.diy solely to upload pictures of her journal spreads and entries. She has also uploaded a YouTube video under her eponymous channel showcasing her monthly spread pages for October and reveals that she has plans to upload similar videos regularly. She will upload her January bullet journal setup within the first week. Suneha Shrestha has always loved art. She says she remembers herself doodling on plain paper and trying to color them when she was really small. This year she decided to take on this hobby of hers a bit more seriously. Just a few months ago she dropped out of her final year of bachelor’s and joined Tribhuvan University’s Bachelor’s in Arts program. “I felt completely burned out when I was studying CA. By the final year, I knew this wasn’t what I wanted to pursue as a career. Art had always been there for me whenever I was down so it was something I loved doing and I thought I should pursue that instead,” says Shrestha adding that she believes people should never fear going after things they are passionate about. She reveals that although this was a terrifying change in her life, she is very grateful that her family stood by her side through all of this. Shrestha runs a stellar Instagram account under the handle @my.doodle.story. She reveals that before she launched this account, she wasn’t into sharing her artwork with other people. But in August 2017, she participated in the ‘Doodle a day’ Instagram challenge hosted by the account@doodle.cha. 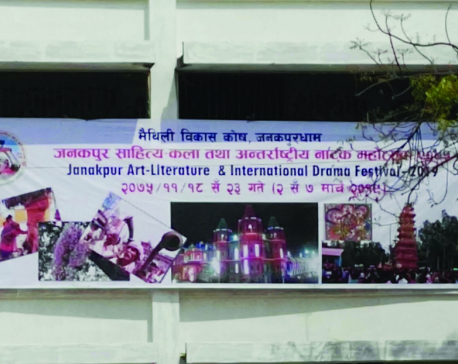 After going through the entries submitted by other participants, she realized that there are other people like her in Nepal who enjoy art very much. “This gave me the push I needed to convince myself that I can actually make a living out of art,” she states. Now she posts all her completed artwork on Instagram. Most of her posts are mandala designs that, Shrestha reveals, is her preferred form of art as she finds it very therapeutic and healing. Besides this, she also has her art journal spreads, full-page sketches, calligraphy designs, and a few sketches and paintings of miscellaneous things and characters like Ariel from The Little Mermaid or Goddesses Durga. A lot of us struggle to come up with creative and pretty designs for mandalas during Tihar but this comes very easily to Sajita Shahi who designs mandalas for a living. 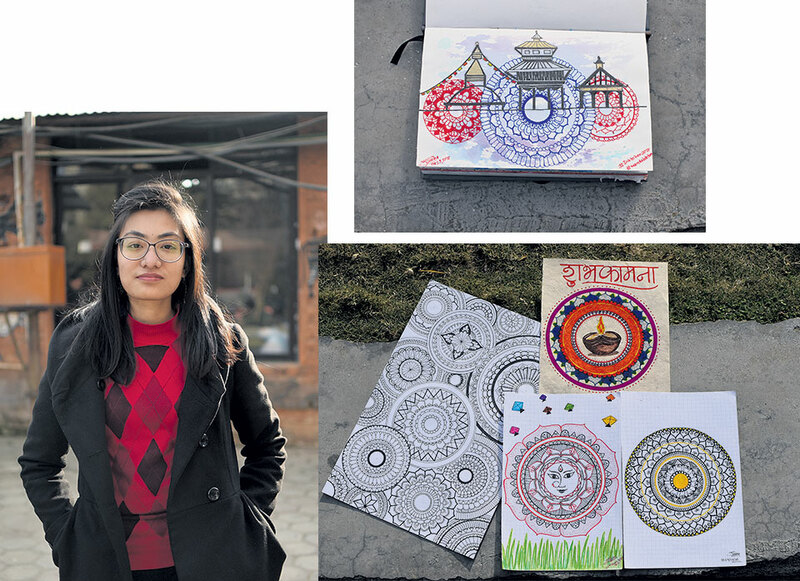 She is possibly Nepal’s first full time mandala designer and even has her own design studio – located at Khusibun, Kathmandu – to showcase her work. Her Instagram presence is also commendable with over 7000 followers. When questioned why she picked this unexplored (at least in terms of our country) field as her career, Shahi states that she believes one of the only way to make your presence known organically and authentically in Nepal is to bring something completely new to the table. “Also, I had a hard time picking up mandala making because there was no one in Nepal who could teach me this subject and I had to learn that on my own. Now that I know this, I want to teach and help other Nepalis who are interested in it,” she adds. Shahi, who has a MBA degree and a diploma in fashion designing, got into art during her school days. She started out with portrait sketching and was even taking classes for it when she discovered mandala making. 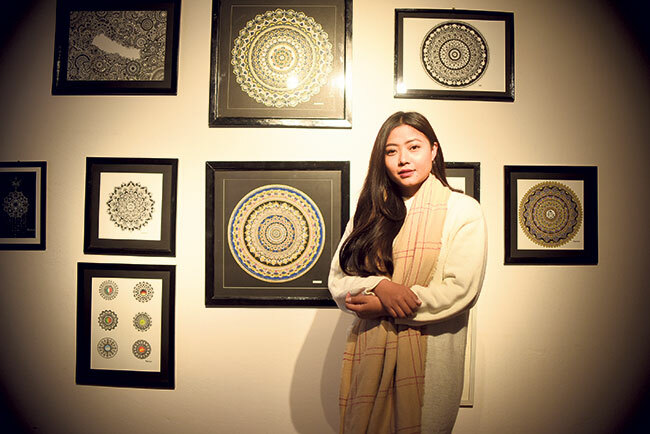 Because this form of art relates to our own culture and history as Nepalis, she wanted to learn more about it and got so enraptured by it that she started exclusively drawing and coloring just mandalas. She reveals that she stuck to it because making all the tiny details and designs for mandalas works as a form of stress buster for her. She further adds that since it takes hours (even days) and complete concentration to complete a single mandala design, she has also become more patient and focused. Currently, Shahi has over two hundreds posts of her mandala designs on her Instagram. Every now and then, you can also find time-lapse videos of her making her designs and in-progress photos of her new designs on her feed. She mentions that she also wants to make YouTube tutorial videos and will probably start working on that sometime soon. Till date, she has completed two mandala design workshops and plans to organize these more frequently in the future.